It wasn’t until we actually went abroad again that we realised how much we missed being abroad. 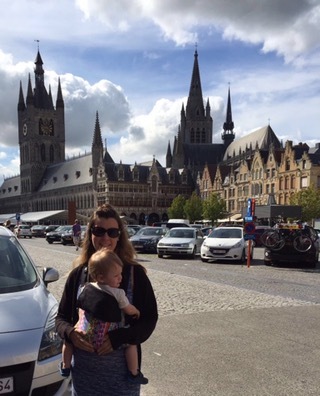 Yes we’ve been to a gorgeous wedding in Scotland and down to our beloved Forest of Dean, and had weekends in Centreparcs and at a cottage in Suffolk, but we hadn’t actually been abroad in 20 months, not since Mrs Lighty was 16 weeks pregnant when we were in Bruges. 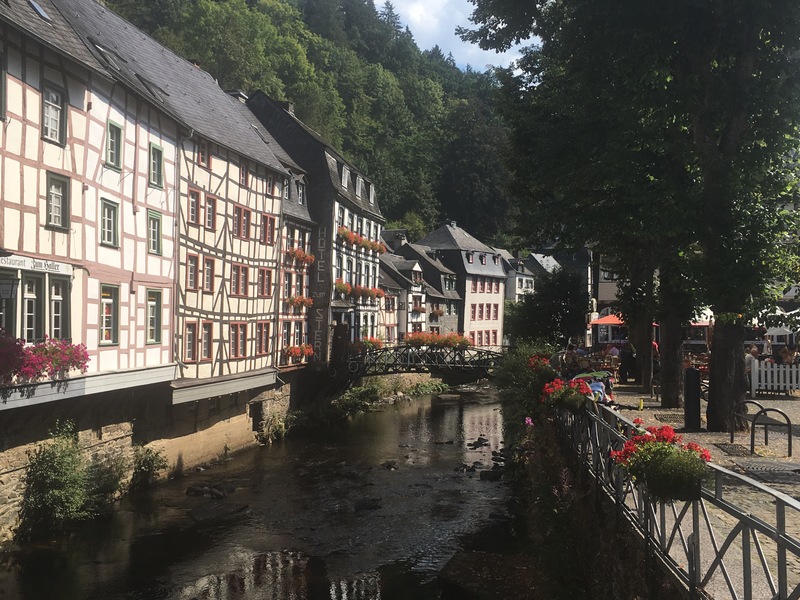 And if we were going to break that trend and take our first family holiday as a three abroad, Monschau, Germany, definitely wasn’t too shabby a place to do so. The sights, the sounds, the smells, the language…oh how I’d forgotten how much I love it! As soon as we emerged through the Channel Tunnel it felt like coming home, yet going away, at the same time. And it was a home away from home that we were travelling to, or so it seemed on arrival. The owners of our holiday apartment, the Konigreich Dreisteigen, which is nestled into the scenery of the Eifel Forest, had set the place up beautifully for children: we had everything we needed, from a nappy change station and plastic cutlery, through to a sand pit on the terrace and a trampoline and garden toys in the front garden. 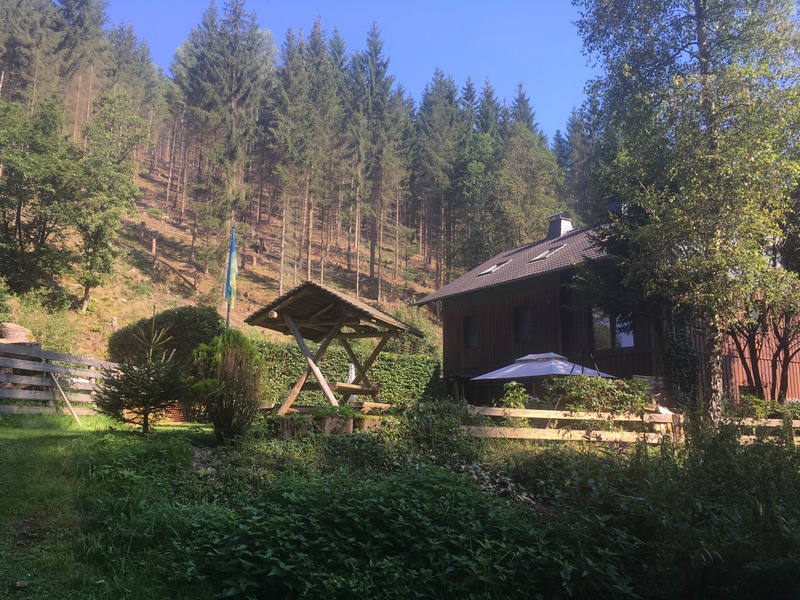 Our home for the bank holiday weekend, nestled into the Eifel National Park. And if the house was welcoming, the same could be said about the town and the people in it. A short stroll from our apartment showed us just how pretty and picturesque a place it was, with higgledy-piggledy, almost alpine style houses, shops and restaurants dotted about the length of the cobbled streets which bordered the banks of the River Rur. Some of the higgledy-piggledy buildings along the river banks. We stopped for dinner that night in a traditional brewery, and as is so often the way with Europeans, they couldn’t’ve been more accommodating of Baby Lighty, who wholeheartedly enjoyed his “Baby’s First Wienerschnitzel”. And who were we to refuse the welcome bottle of fizz on the terrace of the holiday home when we arrived back after our meal?! 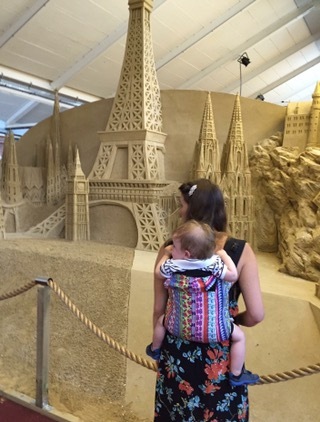 The next day, after more exploring of the town on foot, we came to the Sand Sculpture Museum. A quaint little place, the sculptures were excellent, and there was even an area turned over for the likes of Baby Lighty to play in! We also took the opportunity to visit the craft market which is housed in the same building while we were there. There’s also a year-round Christmas shop in the town’s central square, if, like Mr and Mrs Lighty, you love to buy decorations wherever you go. 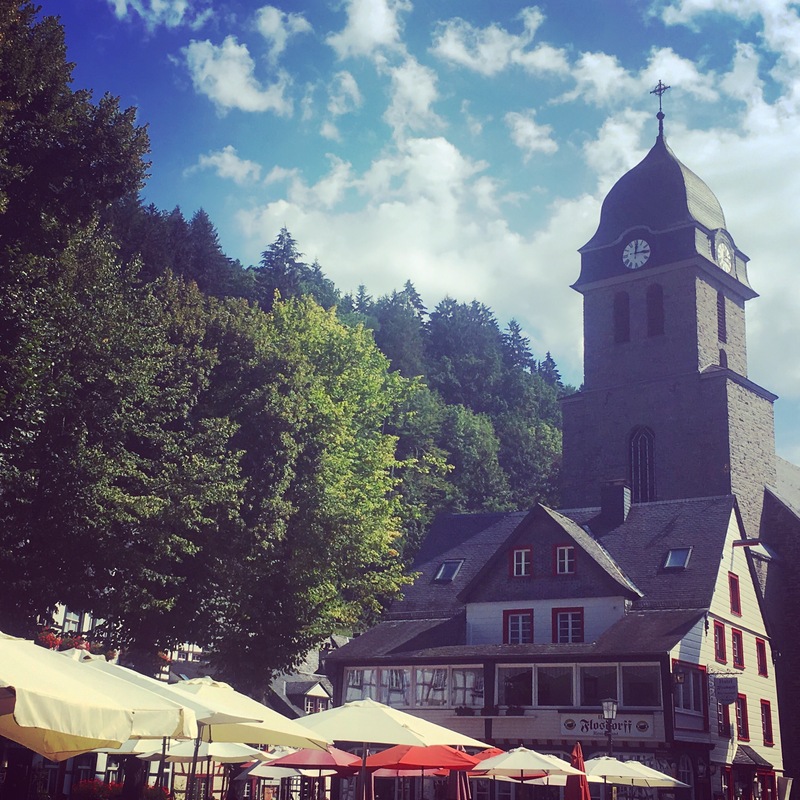 The fact that there’s a craft market and a Christmas shop in the town shows just how much Monschau suited the Lightys: these are exactly the sort of places we like to mooch around whether home or abroad! At the sand sculpture museum. It was important to me that Baby Lighty enjoyed his first experience of being abroad too, and as well as getting fully stuck into the food (Wienerschnitzel as mentioned above, Monschauer ice cream and – as written about on our sister site, All Things Spliced – the Milchbrot bun kindly given to him free of charge by the lovely lady in the bakers), we also let him have some fun-time back at the apartment. 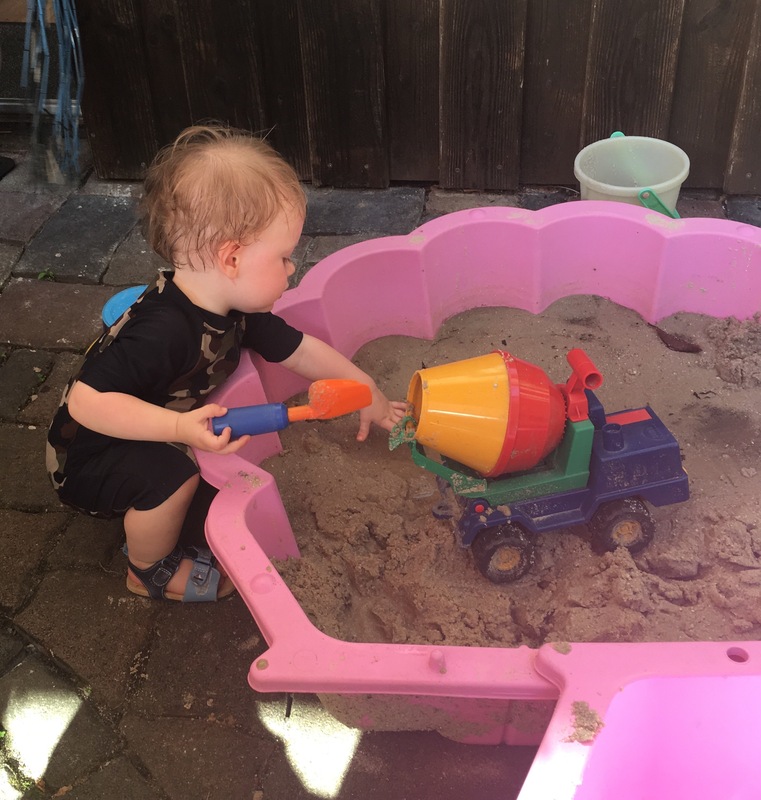 He loved playing with the sandpit on our first afternoon after the visit to the Sand Sculpture Museum, and enjoyed his first time trampolining on our second afternoon, as well as playing with the many little ride-on cars that the owner had left for any children staying to play with. Enjoying the sandpit at the apartment! 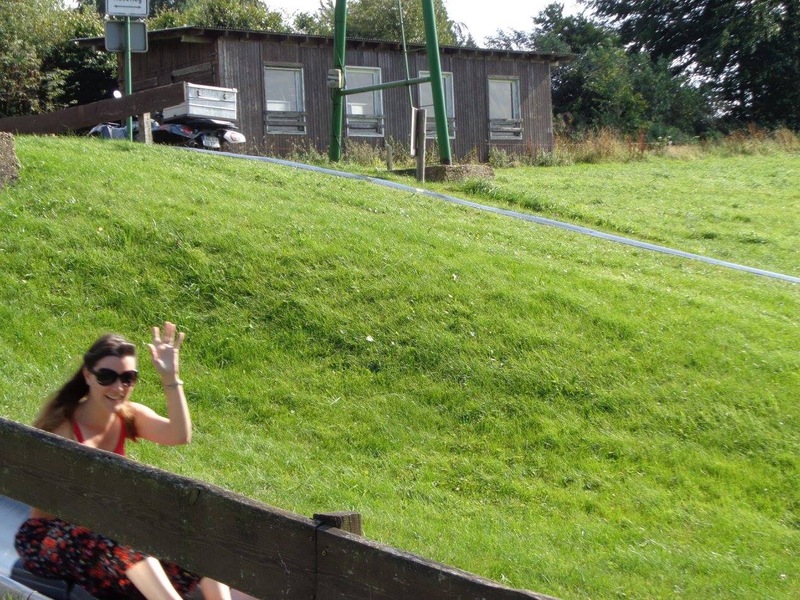 For us big kids, the town’s road train was a great compromise between seeing a bit more of the town and doing something fun for Baby Lighty, and then there was the Rodelbahn (summer toboggan) in nearby Rohren. At 751 metres long, it’s one of the longest summer toboggan runs that we’ve been on, and its many twists and turns kept us guessing. Daddy Hatchy even managed not to fall off and Brother Hatchy was surprisingly sensible for a change and managed to create a traffic jam with all his breaking in the correct places!! 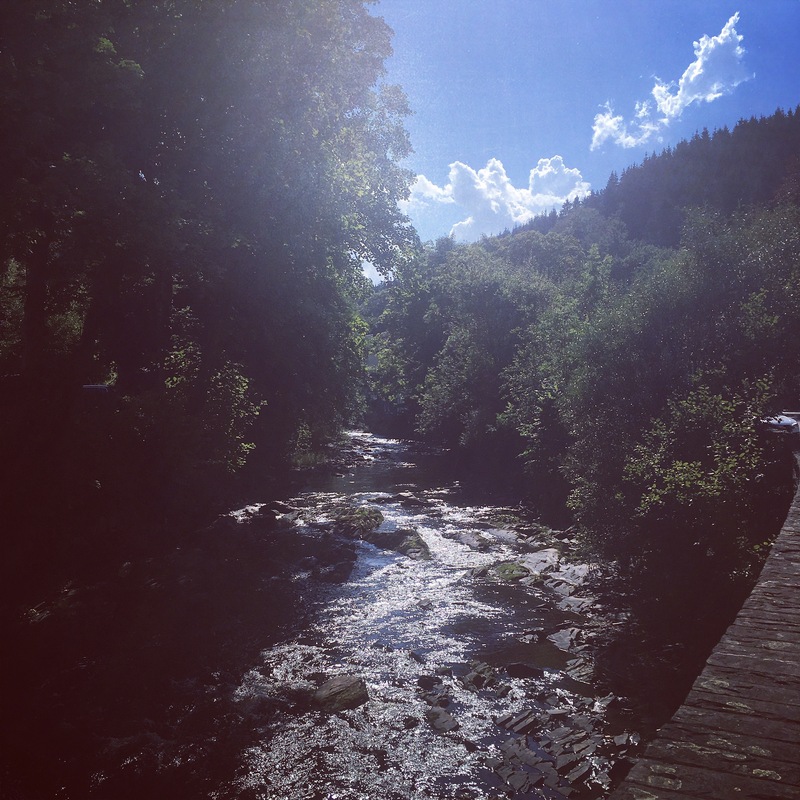 We really only scratched the surface of beautiful Monschau, as we spent a lot of time relaxing in the holiday home and enjoying leisurely breakfasts on the terrace. The apartment had its own private ‘beach’ (read: riverbank) on the edge of the Rur, with a lovely babbling waterfall rushing past, and the glorious weather we had all weekend drew us towards the garden like a magnet. If we had stayed longer, or hadn’t had the beautiful weather that we did, we would have no doubt attempted one of the nearby zoos, or had a round of mini-golf while at the Rodelbahn sports complex. We would have also liked to have taken a later tunnel crossing home, as this would have allowed us a slightly longer stop in the poignant-but-pretty Belgian town of Ypres on the way home. As it was, we only had a pitstop with a walk up to the Menin Gate, so that’s another town that’s on our list to explore properly. Monschau has definitely whet our apetite for foreign travel again, so perhaps we’ll just have to make the time for a trip back?! Its old-world charm and quaint beauty meant that we could have spent a long time just soaking the town up. This entry was posted in City Break, Family Friendly Holidays, Forest Holidays, History and Heritage, Self Catering Holidays and tagged City Break, Eifel Forest, Eifel National Park, Family Friendly Holiday, Forest Holidays, Germany, History and Heritage, Monschau, Scenery, Self Catering Holidays. Bookmark the permalink.